Flambé is also a type of ceramic glaze. Flambé (/flɒmˈbeɪ/, French: [flɑ̃be]; also spelled flambe), is a cooking procedure in which alcohol is added to a hot pan to create a burst of flames. The word means flamed in French (as, in French, flambé is the past participle of the verb flamber). 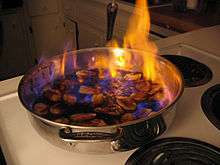 Flambéing is often associated with tableside presentation of certain liqueur-drenched dishes, such as Bananas Foster or Cherries Jubilee, when the alcohol is ignited and results in a flare of blue-tinged flame. 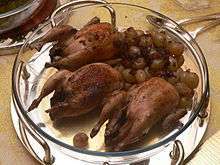 However, flambéing is also a step in making coq au vin, and other dishes and sauces, using spirits, before they are brought to the table. By rapidly burning off the volatile alcohol, flambéing can infuse a dish with additional aroma and flavor, and moderates the harshness of raw, high-proof spirits. The partial combustion of the flammable alcohol results in flames which quickly consume the liquid, however, some residual flavors usually remain. Modern flambéing became popular only in the late 19th century. According to his own story, it was discovered in Monte Carlo in 1895, when Henri Charpentier, a waiter, accidentally set fire to a pan of crêpes he was preparing for the future Edward VII of the United Kingdom, which he named Crêpe Suzette after the prince's companion. He discovered that burning the sauce affected its flavor in a way that he could not have anticipated. Larousse Gastronomique, however, disputes this story, claiming Charpentier could not have been old enough at the time to be serving royalty. Simply lighting food on fire is flambéing in and of itself. Igniting a sauce with alcohol in the pan changes the chemistry of the food. Because alcohol boils at 78 °C (172 °F), water boils at 100 °C (212 °F) and sugar caramelizes at 170 °C (338 °F), ignition of all these ingredients combined results in a complex chemical reaction, especially as the surface of the burning alcohol exceeds 240 °C (500 °F). Because of their high alcohol content, some recipes recommend flambéing with liquors such as Everclear or 151. However, these spirits are highly flammable and are considered much too dangerous by professional cooks. Wines and beers have too little alcohol and will not flambé. Rum, cognac, or other flavorful liquors that are about 40% alcohol (80 USA proof) are considered ideal. Cinnamon is sometimes added not only for flavor but for show as the powder ignites when added. The alcoholic beverage must be heated before lighting it on fire. This is because at room temperature, the liquid is still below the flash point, and there are not enough alcoholic vapors to ignite. By heating it, the vapor pressure increases, releasing enough vapors to catch fire from the match. Since taste is a very subjective sense, not everyone can discern a change in flavor as a result of flambéing. Some claim that because the flame is above the food and since hot gases rise, it cannot significantly affect the flavor, although in an informal taste test conducted by the Los Angeles Times of two batches of caramelized apples (one flambéed and one simmered), one tester declared the "flambéed dish was for adults, the other for kids". 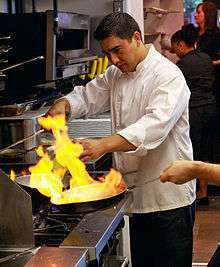 Others, however, dispute this and quote celebrated French chefs who claim that flambéing is strictly a show-biz aspect of restaurant business and ruins food and is done to create an impressive visual presentation at a dramatic point in the preparation of a meal. For safety reasons, it is recommended that alcohol should never be added to a pan on a burner, and that the cook use a long fireplace match to ignite the pan. ↑ Charpentier, Henri; Sparkes, Boyden (2001-02-20) . Life à la Henri: being the memories of Henri Charpentier. Modern Library. p. 54. ISBN 978-0-375-75692-4. Retrieved 9 December 2011. ↑ Lovegren, Sylvia (2005-06-01). Fashionable food: seven decades of food fads. University of Chicago Press. p. 170. ISBN 978-0-226-49407-4. Retrieved 9 December 2011. ↑ "Science of Candy: Caramelization & Caramels". Exploratorium. Retrieved 9 December 2011. 1 2 "Flambé". What's Cooking America. Retrieved 9 December 2011. ↑ Karukstis, Kerry K.; Hecke, Gerald R. Van (2003-03-27). Chemistry Connections: The Chemical Basis of Everyday Phenomena. Academic Press. p. 7. ISBN 9780124001510. Retrieved 18 September 2012. ↑ Hess, John L.; Karen Hess (2000). The Taste of America. Champaign, Ill.: University of Illinois Press. p. 355. ISBN 0-252-06875-0. Wikimedia Commons has media related to Flambé.